Food is our most intimate and telling connection both with the living natural order and with our living cultural heritage. By eating the plants and animals of our earth, we literally incorporate them. It is also through this act of eating that we partake of our culture’s values and paradigms at the most primal levels. It is becoming increasingly obvious, however, that the choices we make about our food are leading to environmental degradation, enormous human health problems, and unimaginable cruelty toward our fellow creatures. 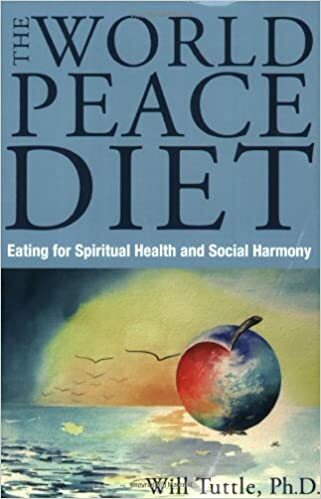 Incorporating systems theory, teachings from mythology and religions, and the human sciences, The World Peace Diet presents the outlines of a more empowering understanding of our world, based on a comprehension of the far-reaching implications of our food choices and the worldview those choices reflect and mandate. The author offers a set of universal principles for all people of conscience, from any religious tradition, that they can follow to reconnect with what we are eating, what was required to get it on our plate, and what happens after it leaves our plates. The World Peace Diet suggests how we as a species might move our consciousness forward so that we can be more free, more intelligent, more loving, and happier in the choices we make.